Ai Tenshi Densetsu Wedding Peach anime and manga series by Sukehiro Tomita and Tachibana Mami images and info. Part of a diverse shoujo anime, manga, video gaming, and live-action Japanese drama website. "Ai Tenshi Densetsu Wedding Peach" is a mahou shoujo series perfect for audiences of all ages, especially romantics and lovers of cute! The character designs for the anime were done by Tadano Kazuko, who also did the designs for the "Bishoujo Senshi Sailor Moon" anime series. Those who love Sailor Moon will undoubtably enjoy this show, as it has many similarities but also many differences. the Angel World and the Demon World, with the Human World being the battle ground. The Angels' four most powerful magical talismans, the Sacred Something Four, were lost in the Human World long ago. When the Demons learn of this, they begin to search through the Human World for the talismans. The Angels' chief lieutenant, Limone, chooses Momoko and her two friends to help defend the Human World from the Demons and to help him recover the Sacred Something Four. If they fail, the Demons will rule supreme, establishing a reign of hatred over all three worlds. The story has various plot twists and turns, although it doesn't reach the real heart of the story until perhaps volume three - the first two volumes serve to introduce the characters and basic background. All three girls have a major crush on the captain of the soccer team, Yanagiba Kazuya, and the competition between them to win his heart provides a unique approach to the usual romantic drama found in these types of shows. The lead goalee of the soccer team, Fuuma Yousuke, constantly teases Momoko, causing her endless grief - underneath all this, though, it is very apparent that they like each other, despite their own protests against it. An agreement develops between Hinagiku's childhood guy friend and a Demon. Other characters, including the Demons, have personalities and stories that make this much more than a simple good guys vs. bad guys tale. All of these character interactions cause a great deal of comedy and drama in the story - one viewer found herself laughing at some points and crying 10 seconds later! One important point that makes this series very different from many of the current mahou shoujo stories is that the three girls very rarely physically fight their opponents - instead, Angel Lily (Yuri) and Angel Daisy (Hinagiku) use their powers to immobilize the Demons they face so that Wedding Peach (Momoko) can purify them with the Power Of Love. Everything in the series revolves around the idea that the Power of Love, if it is pure enough and one's belief in it is strong enough, is stronger than any other power or force and that all life can coexist peacefully. 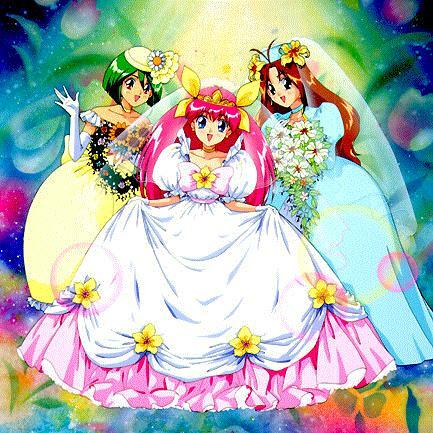 "Ai Tenshi Densetsu Wedding Peach" combines many traditional magical girl elements with those of more contemporary shows such as "Bishoujo Senshi Sailor Moon" to create a fantastic viewing experience. In addition to the various young shoujo elements, the creators have infused the show with countless symbolic references. The story draws inspiration from the traditional Western wedding ceremony, the various etiquette elements that surround it, the Biblical story of the Devil being an angel who was cast out of heaven, and using command phrases that are partially in French, considered the "language of love" all over the world. The series is designed for the hopeless romantic in everyone.